Modell ist sehr schön mit vielen Details. Sie ist aus Messing und Kunststoff. Sie ist auch recht schwer 575g (Steam Lok) 787g (Steam Lok mit Tender). Der Sound ist Standartmässig recht Laut eingestellt. Alle Funktonen machen das was sie müssen. Ebenso der Synchrone Rauch. Sobald er aktiviert ist. Heute ist die GN S-2 4-8-4 #2582 mit Vestibule Cab per Post gekommen. Bestellt habe ich sie mitte 2015 und gleich Bezahlt. Habe über Werner Meer eine Mail von Walthers bekommen. Wo Mitgeteilt wird. Das die GN S-2 4-8-4 DEFINITIF nicht Produziert wird. Diese Seite bleibt aber trotz dem so bestehen. Da sie Irgend wann vielleicht doch noch jemand Produzert. In DCC w/Sound. Ein Film von den Tests ist am Schluss dieser Seite zusehen! Mit entsprechenden Gebrauchsspuren versehen. Damit sie Ihren Speckglanz verliert. Die Gebrauchspuren entstanden anlässlich des Modellbauseminar Südwest in Baiersbronn. Der Meister der Airbrush war Henning Rohrmoser. Filme vom Modell, sind am Schluss der Seite zusehen! In March and April of 1930 the Great Northern Railway received fourteen 4-8-4's from Baldwin, assigning them to the S-2 class and numbering them 2575 through 2588. Intended for Oriental Limited and Empire Builder duty they were assigned to the Montana division for service between Williston, ND and Havre, MT, and the Spokane division for service between Spokane, WA and Wenatchee, WA. The design of the S-2 Class 4-8-4 was somewhat of a departure from the traditional steam locomotive design on the Great Northern. Normally the GN preferred to equip its engines with a Belpaire type boiler, but in an effort to reduce weight, the S-2's were delivered with a radial stay boiler. The nickel-steel boiler tapered from a 85 1/4" diameter at the front, to a 94" diameter at the dome ring. 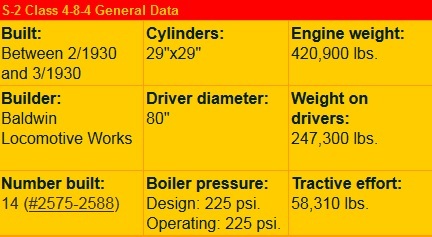 It was constructed for a design and operating pressure of 225 psi. The boiler had a firebox measuring 138" long by 102" wide, designed to burn oil. A Walschaert type valve gear transmitted power from the 29" diameter by 29" stroke pistons to the drivers, which were 80" in diameter, the tallest on any Northern. The only major rebuilding of this class was the replacement of the original friction bearings with Timken roller bearings in the 1940s. Some engines were temporarily converted to burn coal for a period in the late 1930s. Vestibule cabs were added to engines 2577 (in the early 1930s) and engines 2582, 2586, 2587 and 2588 (by the late 1940s). S-2 engines were involved in two of the better-known accidents on the Great Northern. On August 9, 1945 engine 2588 was involved in the worst accident on the GN when it was on the point of the second section of the westbound Empire Builder. It rear-ended the first section at Michigan, ND which had stopped there due to a hotbox. The impact was so heavy that it split open the observation car, killing 34 people, and wounding 303. The ICC cited a failure to provide adequate protection for the preceding train as the cause. Engine 2581 experienced a boiler explosion caused by a crown sheet failure due to a low water level at Crary, ND on January 9, 1947, killing the engineer, fireman and the Division Roadmaster who was riding in the cab. Following the accident 2581 was scrapped, having earned the questionable honor of being the last engine to experience a boiler explosion on the GN. retired in December of 1957. In 1958 it was decided to hold her for historical purposes. On May 15, 1964 she was put on display at the Havre, MT depot, where she is still residing today as a fond memory of the superb passenger steam power once used on the Great Northern Railway. Retired after boiler explosion at Crary, ND 1/9/1947. Retired 12/1957. Held for historical purposes 3/21/1958. Click here for more dimensions and information on other tender styles and classes. Mit Gebrauchsspuren. Wie die gebrauchsspuren entstehen. Sowie das End Resultat.